Ikuta ryokuchi baraen (生田緑地ばら苑) is a rose garden located in Kawasaki city. 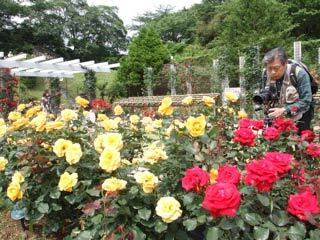 There are about 530 kinds 4,700 roses in this garden. It is one of the oldest rose garden around Tokyo. Many people visit here during rose season and enjoy the beautiful flowers. Note: This garden open twice a year. Spring and Fall when the roses are blooming. The opening season is depend on the how rose are blooming. So, check out their official web site. It opened in 1958. It was called the best rose garden in all Asia.